As history has proven time and again, if there is one bike brand that never ceases to miss out on the latest bike trends, it would be Specialized. When the gravel bug first began to infect the industry, we actually partnered with them in 2015 to help build a Dirty Kanza project bike. 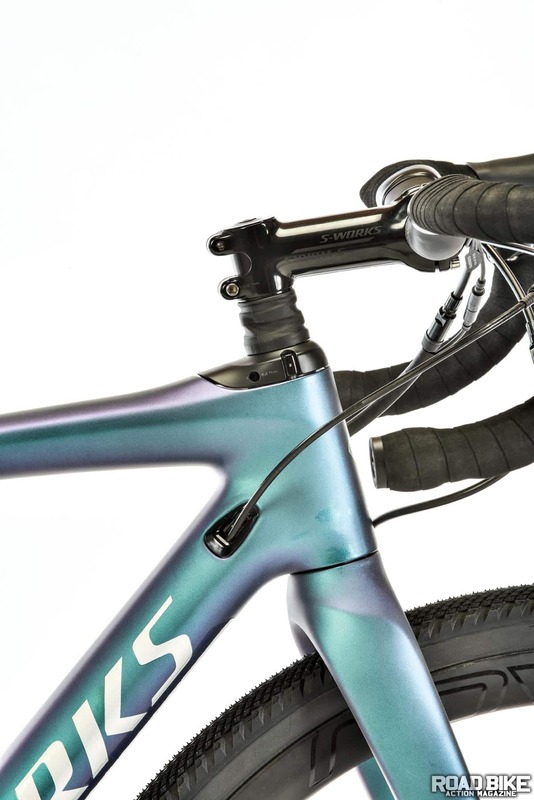 From that bike (based on a Crux cyclocross bike), Specialized has created a few new platforms of drop-bar bikes not intended for their traditional racing customer. The Diverge has been a big project for them, and the development of this latest version has spanned over three years. The research into the off-road segment of their road category has given rise to a variety of design improvements that have even found their way into their race category too. 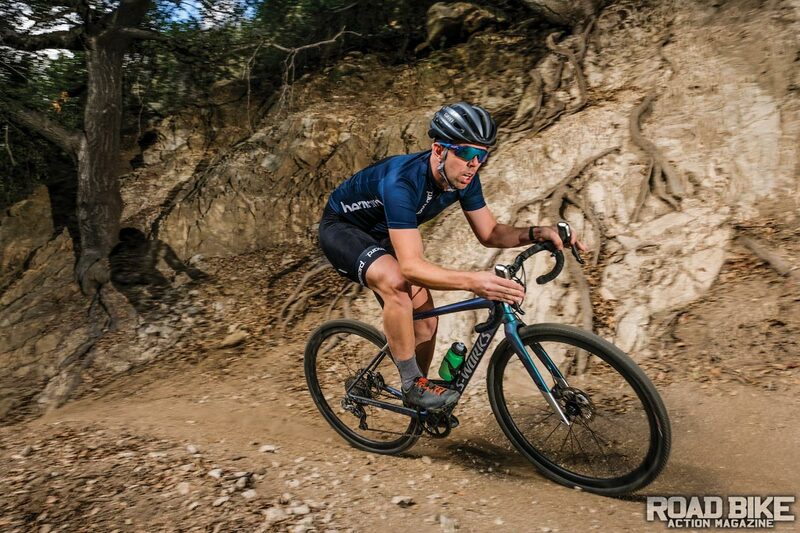 The new Diverge didn’t just add the Future Shock from the Roubaix and call it a day. The geometry changed, too, with a 10mm-lower 386 bottom bracket, as well as a longer (100.4cm) wheelbase. 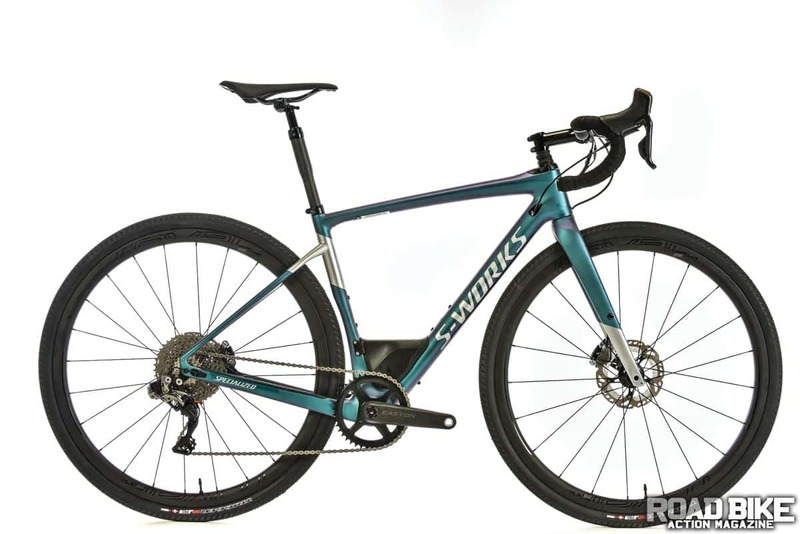 This Diverge uses Specialized’s highest-grade FACT 11r carbon for the frame, which is specific to the S-Works version and where much of the price hike lies thanks to its minimal weight-to-stiffness ratio. They also offer the rest of the carbon Diverge line with the slightly heavier FACT 9r carbon, even at $2100 for the Sport version. The Diverge Future Shock front suspension differs from the linear spring used on the Roubaix to a new progressive-wound spring. This means that the spring rate changes as compressed, minimizing the bottom-out effect. The rest of the unit is identical with 20mm of travel and carries the same look and function. Below the Future Shock is a frame head tube of 12cm, but because of the added height of the Future Shock, it’s really at 15.8cm with an angle of 71.9 degrees. Not a motor, the Swat Box houses everything a saddle bag would. It sits just above the bottom bracket and still allows for two water bottle cages inside the main triangle. 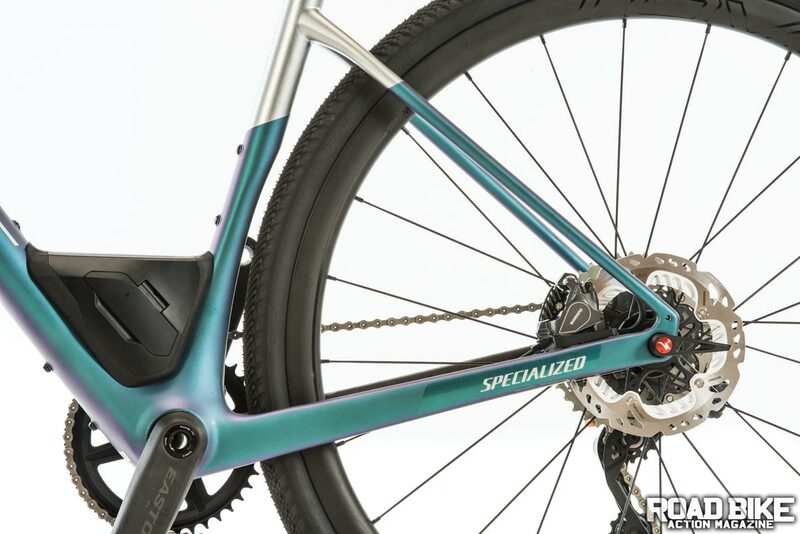 While this is a 2018 model, the release was before Shimano’s new 9100 shifters had become available, so the Shimano R785 Di2 levers with hydraulic flat-mount disc calipers were used instead. The levers are mated to an XTR Di2 mountain bike derailleur, because Shimano doesn’t have a 1x road derailleur. An Easton EC90 SL crank with a direct-mount 42t ring runs with an 11-40 cassette. Roval AFD hubs, CeramicSpeed bearings and DT Swiss 240 internals. These rims are tubeless-ready with 20.7mm internal and 28.1mm external dimensions. A set of 700x38mm Trigger Pro 60-tpi tires that are tubeless-ready are mounted to the wide rims. A pair of 160mm rotors take care of the stopping duties. The 20mm Future Shock offers compliance above the frame, maintaining the geometry. At first glance, our size 54 looks more like a 52cm frame, but it is an optical illusion. The short head tube; SWAT box; and low, compact geometry give the illusion of a smaller front triangle. The 110mm stem was perfect for us, and the Hover bars look abnormal but offer many hand positions with the raised cross portion that is shaped to fit the hand much better than a round bar. On the road the geometry is a little relaxed but nothing detrimental to the bike’s performance. The added comfort and confidence from the progressive spring in the Future Shock was great and has us wanting to swap out the liner spring on our Roubaix. As soon as we turn off the paved roads the bike truly begins to shine. The wheelbase isn’t as long as it feels, owing to the slack head tube angle. This means confident handling at speed but still maintaining a nimble characteristic at reduced speeds. The Future Shock does an amazing job of going unnoticed under hard efforts, but does a great job of minimizing impact fatigue on long and/or bumpy rides. This design of the suspension above the head tube means frame stiffness and geometry are retained while keeping the rider suspended. The rear end relies on tube shaping and tire size for its compliance. When we were racing down fire roads littered with ruts and imperfections, using the dropper post allowed us to get behind the bike a bit further. We ran the stock 38mm tires, as well as a set of 42mm tires, and there was plenty of clearance with both for mud and debris. We also ran a set of 650b wheels and 47mm tires, but the result was a bottom bracket that was a bit too low and pedal strikes were the norm. The range of the Shimano 11-40 cassette is a bit limiting. The tighter range, when compared to a 10-42, was nice, but both ends of the range are not quite enough. A 42 cog would be better matched when off-road and a 10 cog would be better suited for road descents. The frame fits three water bottle cages, as well as the SWAT Box, which is basically a saddle bag replacement that sits at the junction of the downtube and seat tube. 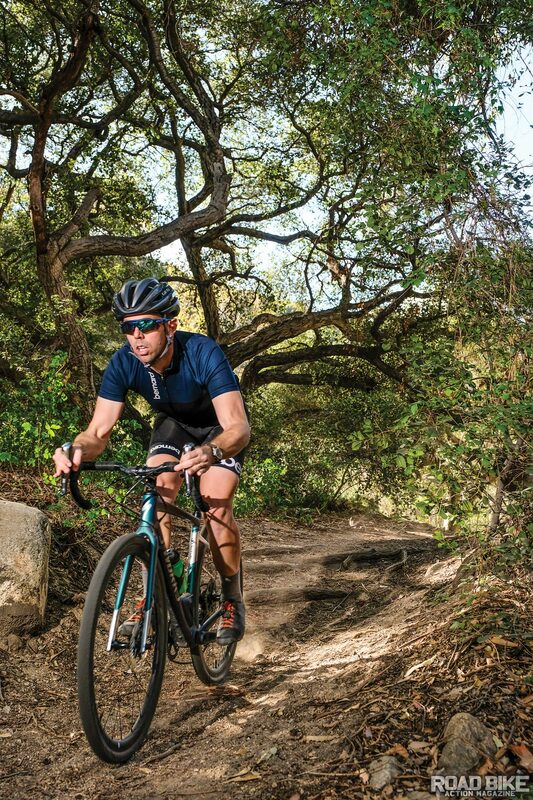 At the end of the day, the Diverge is one of the most versatile bikes on the market. The wheelbase is long and the bike feels stable as speed is increased. The Future Shock is a bit distracting for the first 15 minutes of riding, but you quickly adapt to the newfound comfort and confidence. This is a bike that, with the correct gearing, could qualify as the ultimate do-it-all bike. For $9000 you get a sub-19-pound bike with almost unlimited dual-purpose potential. But if it was us, we would gladly choose the next model down (which is $4000 less) and use the leftover cash for a lavish riding trip in Utah and Colorado where the Diverge platform would no doubt be right at home.